The countdown to the wedding of Bollywood hottest star couple Abhishek Bachchan and Aishwarya Rai began here last night with a glittering sangeet ceremony where Amitabh Bachchan personally welcomed the family of the bride-to-be at the gate of his residence 'Pratiksha' here. Mehendi ceremony will take place today at Aishwarya’s Bandra residence. Aishwarya Rai will tie the knot with fellow actor and rising star Abhishek Bachchan on Friday at the latter's residence in the western Bombay suburb of Juhu. Speculations regarding the date for Bollywood’s most talked about wedding have finally been put to rest. Star couple Abhishek Bachchan and Aishwarya Rai will tie the knot on April 20 in Mumbai. The Bachchans are considered to be close to the erstwhile royal family of Jaipur and chances are that the bash would be held here and be attended by over 6,000 guests, including Bollywood stars, industrialists and politicians. Miss World 1994 and Bollywood actress Aishwarya Rai and actor Abhishek Bachchan were engaged Sunday, according to Abhishek's father, film icon Amitabh Bachchan, at whose residence the engagement took place. Aishwarya Rai is a supermodel and an award-winning actress from India. She is currently regarded as one of the biggest names in Bollywood. She was born in Mangalore to Krishnaraj and Vrinda Rai, in the South Indian state of Karnataka; her mother tongue is Tulu. 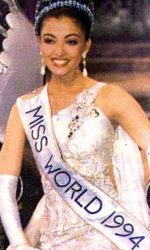 In the 1994 Miss India Contest Rai placed second behind Sushmita Sen and went on to win the Miss World title. As a professional model, Rai has appeared in many Indian fashion magazines, including the Indian Vogue; more recently she has featured in international ads for L'Oréal, De Beers Diamonds, and Coca-Cola. The first film she acted in was the popular Tamil movie Iruvar in (1997, in picture), directed by Mani Ratnam. Rai's earliest films made money, but Rai herself did not impress critics -- they commented that her performances were stilted, as if she were still modeling. Her breakthrough came with Sanjay Leela Bhansali's film Hum Dil De Chuke Sanam. Later successes include Taal and Devdas. Rai has also acted in other Tamil films such as Jeans, Kandukondain Kandukondain, and in the Bengali film Chokher Bali.